Voila Alina, a combination of handbag & crossbody bag we design for you, classy, elegant, charactered women. 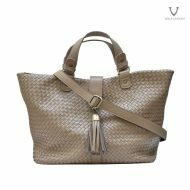 Voila Alina is made of slightly stiff, and strong hermes birkin textured full grain cow leather, and is available in dolphine grey color – perfect for your companion to the office, hanging out with friends, and it looks very cool matched with formal fashion or work outfits. 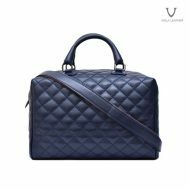 If you are looking for a handbag completed with sling/shoulder/crossbody strap for your everyday daily activities, like going to the office, the mall, or to formal events, Voila Alina Women’s Leather Bag is the right choice. 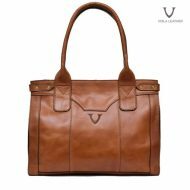 Voila Leather launch a new product, a handbag & crossbody bag for classy and charactered women, named Voila Alina Women’s Leather Bag. Voila Alina is one of the top-handle handbag combine with crossbody bag made for women using strong and slightly stiff, Dolphine Grey even-colored Hermes Birkin texture full grain cow leather. Voila Alina is a classy, medium sized women’s leather bag. Voila Alina is available in Dolphine Grey color, and come with a detachable sling / crossbody / shoulder strap so you have more option on how you want to carry the bag. Voila Alina has magnetic button lock and zippered opening to its main chamber that is wrapped with soft, smooth, not easily torn velvet suede fabric lining for your valuable handphone/smartphone or gadgets safekeeping and easy access. Voila Alina main chamber also completed with two small pouches and one zippered pocket. Voila Alina also has two large pockets on its outer front and backside.